To I received two reports on this event so rather than trying to combine them I have include both, one from an entrants’ view point(Sheila)and one from an organisers point of view (Martin). 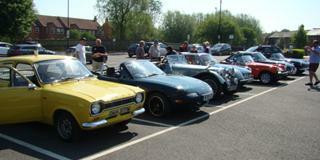 Eleven cars met at the Millgate carpark in Thirsk in beautiful sunshine, tops down ready to enjoy," Le Tour des Villages", organised by Martin and Jackie. 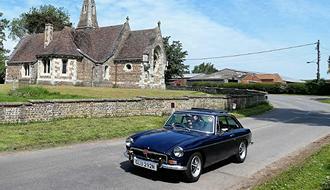 Richard and Jean were in her car as Richard's MGB is in the process of being repaired following a blown head gasket. Bill was without a navigator, so Tony suggested that I should navigate for Bill and Tony would follow, this worked very well. We set off on the 68-mile trip, at around 11am, armed with our excellent instructions. We headed through Boltby meeting a cycling event and classic cars coming in the opposite direction which I believe was The Yorvik Run. We then passed The Yorkshire Gliding Club and on through Kilburn, Coxwold, Easingwold, Tholthorpe and Flawith. On then to Aldwark Toll Bridge, 40p at the ready. Aldwark bridge dates back to 1722 and then rebuilt in 1873, it is wooden and reminded me of the story of The Three Billy Goats Gruff and I'm pleased to say no Troll came out of the water! The bridge crosses the River Ure and apparently there was much controversy when the toll was increased from 15p to 40p, a few years ago, to save the company from financial ruin. The increase makes the bridge the most expensive in the UK per yard travelled. It is used by 700,000 vehicles a year. We then travelled onto Great Ouseburn, Arkendale, Burton Leonard, Bishop Monkton and then passed Ripon racecourse, onto Sharrow, Hutton Conyers, Wath and through Pickhill and onto Carlton Minniot. The scenery and weather were gorgeous for the whole journey. We all met up at around 2pm, in the conservatory, for a lovely lunch at The Dog and Gun, Carlton Minniot. There was, as usual, much chatter and laughter through lunch. We all agreed that Martin and Jackie were to be congratulated on their organisational skills. Thank you, once again, from all that were on the run. Jackie said, “Why don’t we do a run to the south, for a change?” So, I got out the map and had a look to see where we might go. Of course, south of Thirsk is not all open space and moorland, but there did seem to be a number of picturesque villages that we could drive through, and I thought it might be fun to take everyone over the toll bridge at Aldwark. I planned a route on the road atlas, and then drove it by myself to see what it was like. After that it was on to the computer and Google Maps to work out the approximate mileages and look at the signposts and junctions in a bit more detail. That done, Jackie and I set off to drive it, check the route directions and note the mileages. At least that was the plan, but we had not done twenty miles before we came to a ‘Road Closed’ sign. Although it should have been open by the day of the run, the young lady in the local hostelry said that it was often closed, so we decided not to take the risk, and planned the route around it. In order to keep Bill happy, I had planned to go through the ford at Ripon, but when we got there on our second recce, there had been rather a lot of rain and the river was running high and fast. We managed it in our Ford, (sorry, pun intended), but were worried that an MGB or Mazda MX5 but not be too happy about it. Then just round the corner was another ‘Road Closed’ sign. Back to the map again, and it was decided to miss out Ripon and skirt round it. The new route took us past the racecourse, but it never occurred to us that there would be races on the day of the run. Apologies for that. I understand that the race traffic caused quite a hold up. 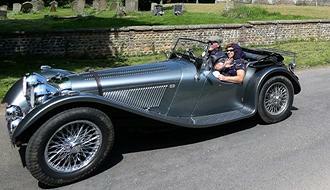 On the day, the fine weather that we had ordered was duly delivered, the sun shone, and the cars looked shiny! Lunch had been booked at the Dog and Gun, in Carlton Miniott, very selfish of us as it was within walking distance of our house, at two o’clock. Each time we had driven the final route, (three times), it had taken one and a half hours, so it was suggested that the cars should leave Thirsk at 11.00am, which would allow time for a short stop en route, and time to get a drink and chat before the food was served. I had planned to take some photos in Aldwark village, with a rather interesting church in the background, which was an hour into the drive, by my reckoning. 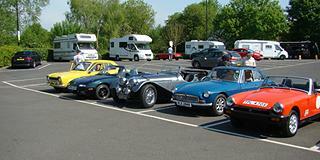 After everyone had left the car park in Thirsk, we drove to Aldwark, arriving at about 11.45. After half an hour I was becoming worried, and my concerns were only increased when at about 12.15 five or six cars went by that I knew had be among the last to leave. Obviously, the drive was not taking as long as I had anticipated, so we abandoned the photo op. and actually drove back down part of the route and saw no other cars. Accordingly, we headed straight for the pub expecting to find everyone already there. However, no-one turned up for at least half an hour during which time I was worried that the directions were misleading and that there were a dozen cars driving in ever decreasing circles around the Vale of York. I need not have worried, as everyone arrived, mostly with tales of delays thanks to the races at Ripon, and the occasional tractor on the toll bridge. So, in the end it was a pleasant result for Jackie and me, and we might even do it again – if asked!